Winter nights are undeniably great for cosy reading on the sofa, but they’re also often ideal for star gazing with kids. Early darkness, not long after getting home from school, combined with frosty, clear nights means that we’re able to look up at the moon, stars and planets long before bedtime. There’s nothing like a bit of awe and wonder before your fishfingers for supper, we’ve discovered. Night Sky Watcher by Raman Prinja is the latest astronomy book we’ve been using to aid our journeys through the night sky. It’s chock full of practical advice, not only on how to find constellations and planets when you tilt your head up to the darkness above, but also how to make your star gazing fun and easy. Night Sky Watcher has separate sections on observing stars, planets and “unusual sights” such as satellites, meteor showers and eclipses. Richly illustrated with astronomical photos, short boxes and bubbles deliver bite-sized parcels of facts and viewing advice, supplemented by activity ideas ranging from joining up stars to form your own constellation to acting out planetary orbits with friends. I love the book’s emphasis on going out there and doing astronomy, not just reading about it. One aspect which has worked especially well for us is the star spotting guide; constellations are presented in their stellar context, with Prinja showing us how once we’ve found one set of stars we can use that constellation to navigate to another. “Star-hopping” has been a big hit and has really extended the girls’ previous experience and understanding of looking up at the celestial sky. The book’s design is rather clever; it comes in a silver edged zipper pouch, which immediately suggests adventurous astronaut gear. The book isn’t “just” a book, it’s part of your night sky watching equipment designed for taking outside and using in situ. The book’s interior feels equally modern and slick with “astrofacts” appearing every few pages on an iPad/tablet screen and glossy paper adding to the sheen and sparkle of the astronomical photos. Before heading into the dark to look for stars the girls and I boosted our star-pattern recognition skills but making our own bag of indoor magnetic stars which we could move around on the fridge and radiators to form the constellations we’d be looking for once we got outside. Once we had a handful of glowing “stars” we set about making the constellations we wanted to look for in the night sky. Alongside Night Sky Watcher we also used this constellation crib sheet to help us place our stars in the right patterns on a radiator in a dark room. 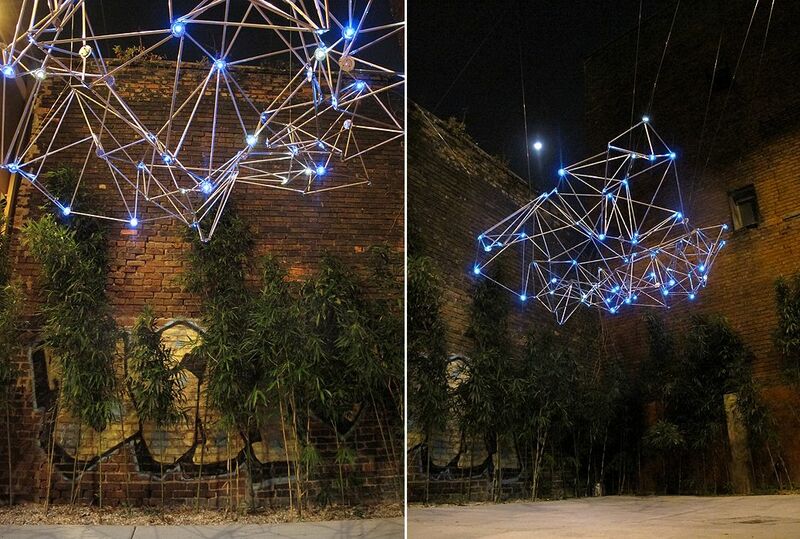 Can you tell which constellation this is meant to be? It’s the central part of Orion, featuring the belt, Betelgeuse (top left) and Rigel (bottom right). Once we’d made a few constellations the girls got another idea. Recalling the time we “scribbled” with light (using a long shutter release on my camera), M and J wanted to draw the constellations in the air; in Night Sky Watcher (as in standard practice when learning about constellations), the stars are “joined up” by lines to give the constellation’s outline, and it was these outlines that the girls wanted to try and draw. Drawing the constellations wasn’t as easy as using the light magnets to lay out the right patterns and soon our “drawing with the light of stars” became rather free-form. Comet 67P clicking, humming, singing? This playlist from the BBC: Music to watch stars by, part of Stargazing Live. Full Moon, Full Moon by Papa Crow – a big hit this one with us all. Setting up a google alert for news about space exploration. If your child (or you) wants to keep informed about the latest news regarding spaces research and discoveries, you can set up an alert to send you a news digest at a frequency to suit you. Go to https://www.google.co.uk/alerts and type in the terms you’re interested in eg “space”, “exploration”, “lunar”, “comet”. “astronaut” etc. You can then choose to receive notification (via email) of relevant news items, as it happens, once a day or once a week. Building your own starry night visible whatever the weather. There are no instructions with this image, but I love the idea of filling a small courtyard with this sort of installation art. Being inspired by this newly released image of the Andromeda galaxy (the most detailed image to date) to create your own star filled horizon using the splattering of paint. KokokoKIDS does this for falling snow (scroll down a little to the scene with the row of houses), but if you did it on black paper I think it could look like a star filled night instead. Using marshmallows and toothpick instead of LEDs to make constellations, inspired by Edventures with Kids. Other space books we’ve enjoyed recently are How to be a Space Explorer written by Mark Brakea nd illustrated by Emma Jones and Space Exploration: A Three-Dimensional Expanding Pocket Guide by John Holcroft. What space books have you recently discovered? Disclosure: I was sent a free review copy of Night Sky Watcher by the publisher. My daughter would love that book. And beeing a non-tecchy time of girl, I’m going to go with the marshmallows and toothpick option! Hi Claire, oh, don’t be put off – the LED option isn’t techy at all – you just need to go to Maplins to get your supplies (or order online), rather than the supermarket. The kids really were wowed by seeing the LEDs light up when they slipped the legs over the batteries. Can you eat them afterwards? There is a great app called sky view which you load onto your smartphone and hold your phone up against the sky and it will label the constellations on screen for the patch of sky you’re looking at! That’s the lazy way of doing it! Lovely idea, will shamelessly copy. Oh and I came across a book recently that looked good, have asked the library to get us a copy – Professor AstroCat’s Frontiers of Space. Btw Raman Prinja is going to give a free public talk at the Royal Society (or Imperial College?) one of these days – pop over to London?! Oops sorry – mixed up Prof Prinja with another speaker. Apologies! Prof Prinja’s talk is for Sixth Formers only, and at UCL.